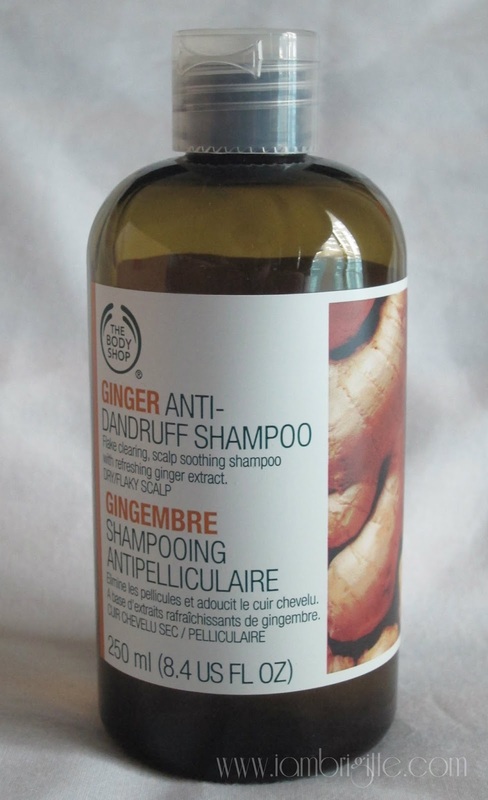 IAMBRIGITTE : Product Review: The Body Shop Ginger Anti-Dandruff Shampoo.. 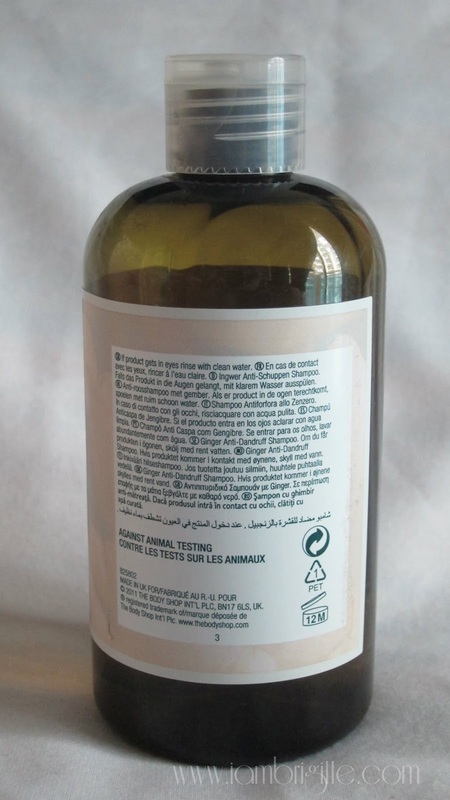 Product Review: The Body Shop Ginger Anti-Dandruff Shampoo.. I am not a fan of my flat, limp hair but one thing I like about it is that it doesn't suffer from probably one of the most common hair problems...dandruff. Maybe it's because like my face, my scalp is oily and dandruff usually affects those with drier scalp. Unfortunately, my husband suffers from it and for years he has been switching from one brand of dandruff shampoo to another. He has tried a lot, even the expensive ones like Kerastase which to our dismay, even made his dandruff worse. He eventually settled for Head & Shoulders (Classic Clean variant) and though his dandruff problem still remains, it is by far what he likes the most among all those he has tried. I actually feel guilty for not being able to help my husband with his scalp problem. I am a (beauty) blogger and migawd, I scour the net for stuff to try and review but didn't even really bother looking for products that will totally make his dandruff go away. So one day when he was getting all frustrated again after seeing a lot of flaking on his scalp, we turned to dear Google and typed the words "best dandruff shampoo" away. We did get a lot of recommendations but the first one which got our attention was the Ginger Shampoo from The Body Shop, mainly because it's easily accessible. After using it for days, the husband noticed that it made his scalp flake a lot more. But eventually, it stopped. It's probably like when you use a new skincare product and your skin goes thru a purging stage kind-of-thing. He said his scalp isn't as dry as it was before and that he didn't experience any itching at all. After more than a month of using it, he says that he is again experiencing some flaking but not as bad as before. He says it's just "mababaw" and not as thick as it used to. Actually, I haven't seen dandruff flakes on his shirt for quite some time so I guess this shampoo really works. Maybe not 100%, but it's working. I don't suffer from dandruff but I used it for quite a few times already. It has this subtle spicy ginger scent which is actually addicting and it feels so fresh on the scalp. It's light and doesn't make my hair oily. Contrary to what some users say online, I didn't feel the need to use a conditioner as my hair already feels soft after using this. And it lathers well too! To date, Mr. X says this is the best anti-dandruff shampoo he has tried, but since he still gets a bit of flaking on some days, I think we'll try other recommendations after he finishes this bottle. Maybe we'll try the Jason shampoo next, or Neutrogena, and hopefully they are available here in UAE. I also read that Kiehl's has an anti-dandruff shampoo too and based on reviews online, it's also worth checking out. How about you? Do you suffer from dandruff too? If you have other product recommendations as well, they are all very much welcome. Let me know! Try nanny rose anti-hairfall shampoo.. It's not an anti dandruff shampoo but eversince I used it, I never had that much flakes anymore. I got it watsons here in Manila.